Another new addition to our terry robe collection is the classic Burgundy maroon colour which is made from a very soft fabric and perfect for all seasons. It has the classic shawl and loose fitting making it very comfortable to wear and ideal for hotel or spa or even for normal personal use. The deep red colour of the bathrobe makes it ideal if your logo is a light colour shade which will make it really standout on the maroon fabric base. Comes in a range of sizes from stock for fast delivery all over the UK and EU. 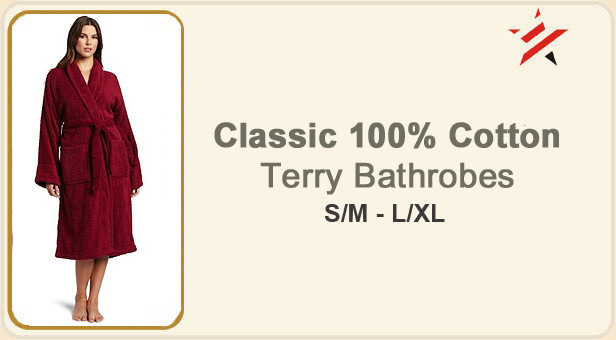 Comes in range of sizes from S/M to L/XL and made from 100% soft terry cotton.